• A CREE XP-G3 S5 LED,MAX output up to 550 Lumens. • Head contact swith design,easy to operate,3 level lumens and strobe. • Low lumens mode to protect the user's eyes at beginning of power on. • Use a rechargeable 130mAh Li-ion battery. • Micro USB charging port with dual-color LED indicator. • Quick charge in 45 minutes only. • LED in red to show low power,easier to know the battery capacitChay. • Built smart temperature controller,into the head of the torch to protect the circuit. • Multiple grooves design,easy to adjust/fix the location for different use. 1.Please fully charge the flashlight before you turn it on the first time. 2.A second long button press turns it on and off please. 3.How to open the usb cover:Look on the edge of the metal body where it looks like a rubber hinge. Grab the edge of that little rubber tip with your nail and pull it up and the usb cover will easily pop out. Super Bright 550 lumens(max output),EDC(small size,lightweight)mini keychain flashlight,2-year warranty,Factory outlets. 4 different modes for use,Low-High-Med-Strobe.Press to cycle the modes. Micro USB charging port mini torch.Fast charging just need 45 Minutes.4.2V/130mAH rechargeable Li-ion battery,never leakage. 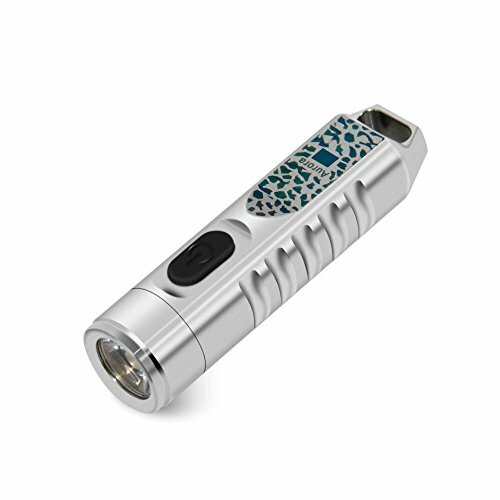 Full Stainless Steel material,difficult to discolored,compact structure lighweight outdoor EDC mini torch,life waterproof of IPX-65,not afraid of getting wet. CREE XP-G3 1A 6000-6500K S5 led light,Max Beam Intensity 980cd,Max Beam Distance 80m,1.5m Impact Resistance,Luminous angle 10°. If you have any questions about this product by RovyVon, contact us by completing and submitting the form below. If you are looking for a specif part number, please include it with your message.